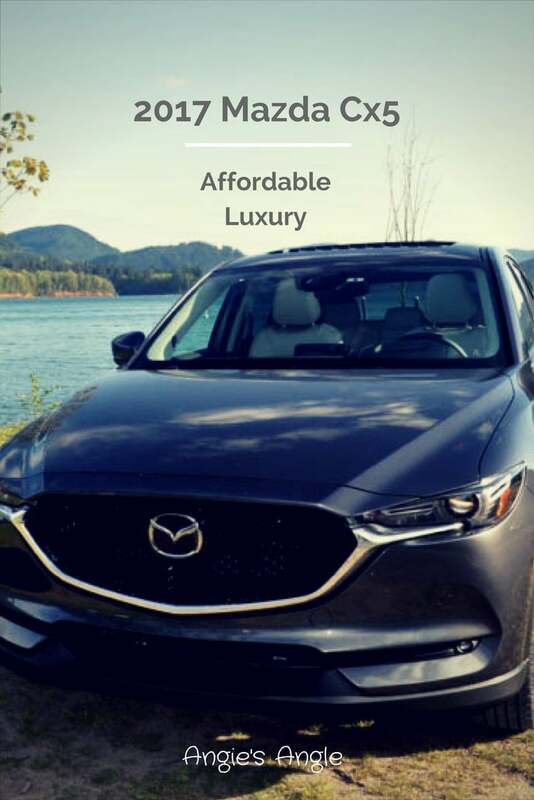 I received this 2017 Mazda Cx5 free for a week to test drive. Thanks to Mazda! However, all thoughts and photos are 100% my own. 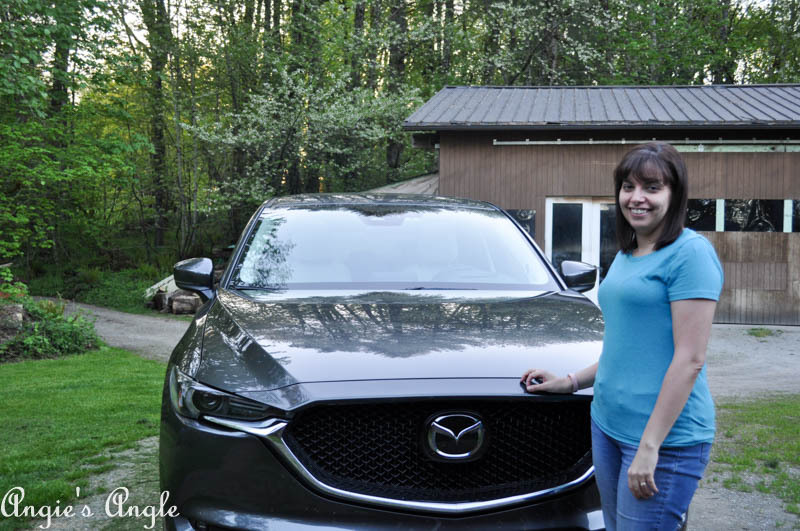 While I have had the honor of testing several types of cars over the course of my journey on this adventure, I have to be honest, I have a soft spot for Mazdas. There is something about them that just calls to me and says here I am, I am all yours, baby. 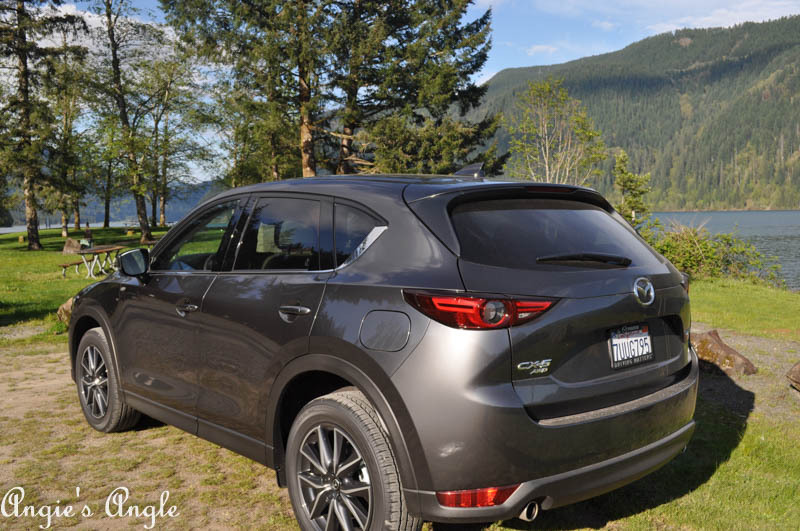 This 2017 Mazda Cx5 was no different. In fact, I told Jason that this felt like the one. You know that one. The one you just get into and feel this is the perfect fit. This was mine. Well, at this moment. Something may sway me before we actually can buy that new car we need. But this just felt amazing. 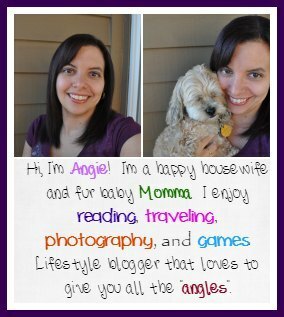 Do I have you curious on what features I just loved in this cute and stylish model? Read and on and fall in love too. The best-laid plans don’t always pan out how you envisioned them. The main reason I wanted a car for the week was to head out to have lunch at Mill Creek Pub for their cash back day to save Dog Paw. Remember Roxy told you all about her adventure to the dog park and how you could help save the dog parks around here? There are these fun activities throughout May to help them earn money. I thought it would be so much easier to go if I had a car for the week. So I asked and got it and I was thrilled. Especially when I was told it was the 2017 Mazda Cx5. But going out to lunch by myself, especially where I had to say why I was there and make sure I got the special coaster as well. It just didn’t happen. I got dressed. Got my shoes on and the more I lagged, the more the thought was just scary as all get out. Hence why I do the type of job I do. So I ended up chickening out and I picked Jason up from work and we headed straight out there to have dinner before his soccer games that night. It ended up working out but dang me and my social awkwardness. The 2017 Mazda Cx5 didn’t disappoint though. See that mean little grin on her. Her cute little grill has such a mean little look that both Jason and I loved. It looks like it means business out there on the road. Not only is the outside super stylish and eye catching but the inside is just amazing. 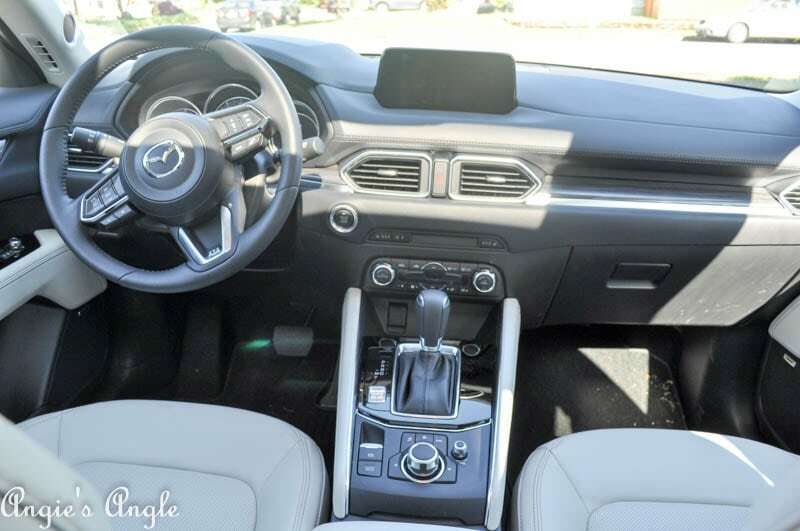 You totally think luxury when you look inside. 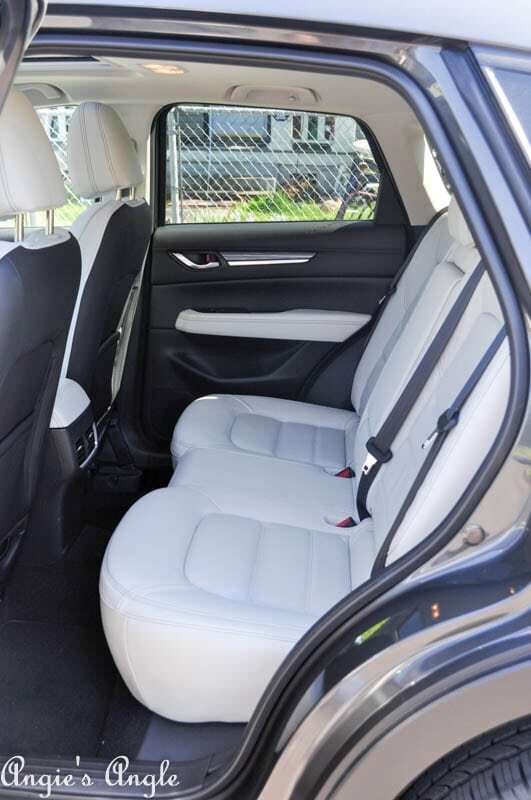 With soft white leather-trimmed upholstery and heated seats, sitting inside is pure pleasure. Plus get this, the back seats are also heated! Yes, you heard me right. The backseats are fully heated as well. 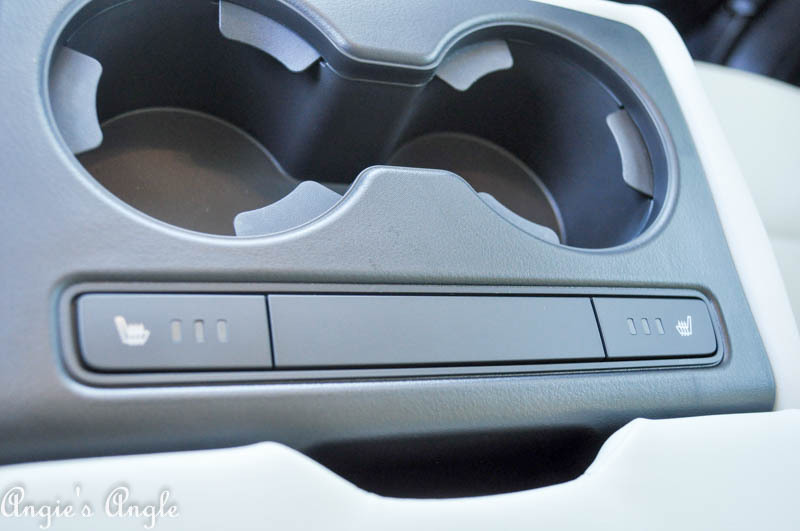 The controls for the heated seats are hidden in the middle armrest/cup holder. Talk about luxury, right? Blew us away! 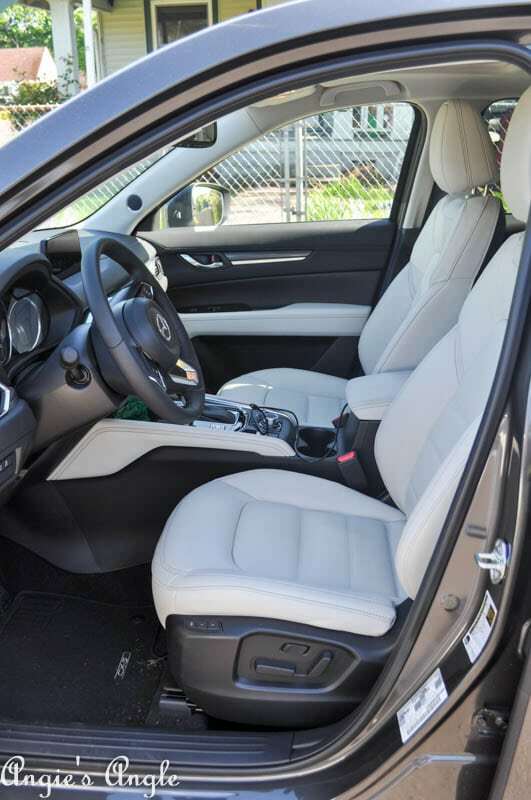 The heated back seats are only included in the premium package which also includes the driver seat two memory positions, 5-way power front passenger seat, heated steering wheel, active driving display, and windshield wiper de-icer. This premium package would run you an extra $1, 830. But I think it would be totally worth it. As I love and adore the heated steering wheel. My hands are almost always cold so this would be especially handy for me. Plus I am quite fond of the active driving display. It sits projected onto the windshield in front of you, displaying the speed you are going and the speed limit itself along with other amazing little features. Driving this beauty is just a dream come true. It has the power we have come to know from Mazda while being super comfortable. Let’s talk about the gas mileage a tiny bit. While not super amazing, it’s not bad for a small SUV like this. It is 23 city & 29 highway with an average of 26. While we had it for the week we average almost 24. 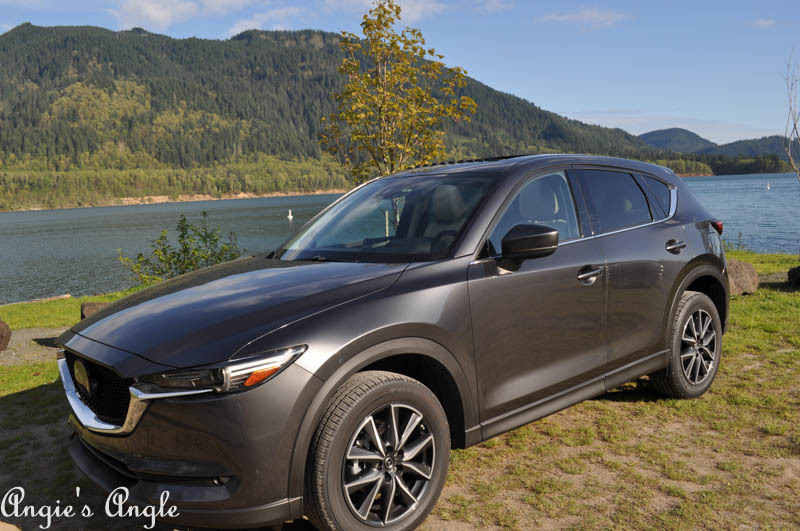 This base model of the 2017 Mazda Cx-5 is a grand touring AWD and will run you around $30,000 for the base price with the extras this one had it would run about $34,000. I think it’s fairly affordable for the luxury feel you get with this cute little gal. 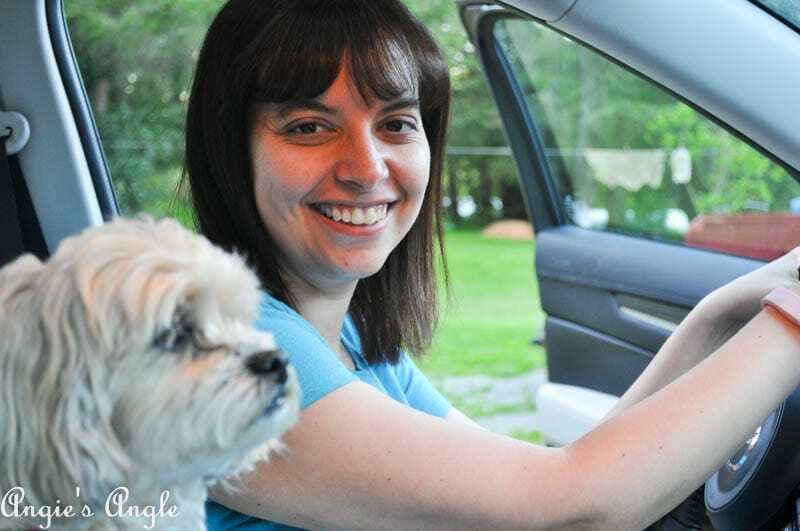 Pretty sure this cute little co-pilot loves these test drives just as much as we do. What do you think? Do you love it as much as I did?